Today in Masonic History Florenz Ziegfeld, Jr. passes away in 1932. 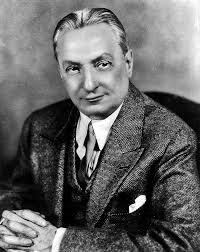 Florenz Ziegfeld, Jr. was an American Broadway producer. Ziegfeld was born in Chicago, Illinois on March 21st, 1867. He began his career in entertainment when his father, who ran the Chicago Musical College, opened a nightclub. The nightclub was less than successful despite Ziegfeld's father's idea that he would take advantage of the crowds attending the 1893 World's Fair. To help his father with the nightclub, Ziegfeld hired and managed the strongman, Eugene Sandow. Ziegfeld would would marry Anna Held in 1897. An actress that Ziegfeld helped promote and had several successful Broadway shows. It was Held that first suggested the idea for the Ziegfeld Follies, basing the idea on the Parisian Follies which was popular in France at the time. There is some doubt that the couple were actually married, although they would be together long enough to be considered common law married. In 1913, Held would divorce Ziegfeld citing his infidelity with an up and coming actress that he had taken an interest in. Following his marriage to Held, Ziegfeld would marry Billie Burke who would go on to play Glinda the good witch in The Wizard of Oz. In 1907, the first Ziegfeld Follies was produced. The extravaganza that was Ziegfeld Follies featured elaborate sets and costumes. All of the women for the shows were hand picked by Ziegfeld. Often he would feature popular composers of the time including Irving Berlin and George Gershwin. Ziegfeld Follies also featured performers that had already become well known prior to their working in the Follies, they gained financial success and publicity by working with Ziegfeld. Some more noted performers were Fanny Brice, W.C. Fields and Will Rogers. With a loan from William Randolph Hearst, Ziegfeld would build the Ziegfeld Theatre in New York City. The theatre opened in 1927 with his production Rio Rita it was followed by one of his most famous works, Showboat. When Showboat opened, Ziegfeld thought he had made giant mistake with the production, the audience sat silent at the end of the production. The following day, rave reviews and a line at the box office alleviated his concerns. Several of Ziegfeld's shows were made into movies, as well as biographical pictures about Ziegfeld were made. He would be the producer of at least one of them with Samuel Goldwyn. Additionally three versions of Showboat were made. Ziegfeld passed away in Hollywood, California from pleurisy, an inflammation of the tissue surrounding the lungs, on July 22nd, 1932. Ziegfeld was a member of Accordia Lodge No. 277 in Chicago, Illinois.